Travelling by helicopter ensures you arrive on time, free from travel-related stress and anxiety. 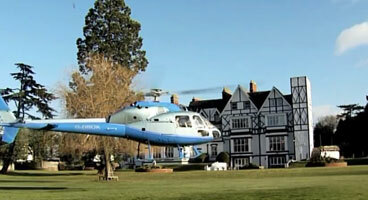 Helicopter hire is also a cost-efficient travel alternative that can easily adapt to your requirements. Enjoy fast and luxurious flights that are tailored to your itinerary and destinations. For birthdays, anniversaries and celebrations add the wow factor with a helicopter charter. Stress-free travel that avoids delays, increases productivity and matches your schedule. Operating since 2001, our pilots flying experience will help you capture the best shots. For an instant flight cost estimate please use this exclusive Online Quote Generator. We are regularly filming from our cockpits, or finding interesting clips from other sources online and in our video section you'll find a feast of helicopter entertainment. Atlas Helicopters are one of the leading providers of business helicopter hire and private helicopter charter in the UK. Established in 2001, we now have our main operating base and HQ at Lasham Airfield which enables us to quickly serve charters from Central London and the Home Counties to anywhere in the UK and near Continent. Delivering a friendly and efficient service, to make helicopter charter seamless and stress-free coupled with an ever-increasing demand in helicopter charter and hire has led to Atlas Helicopters services being increasingly sought after. Our pilots are attuned to the needs of clients and their guests providing a highly customer focused service.